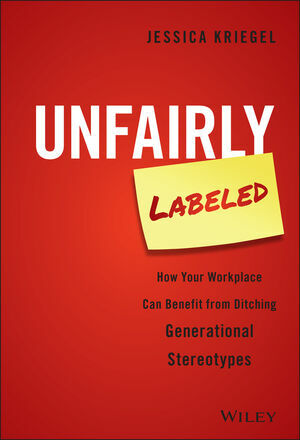 Unfairly Labeled challenges the very concept of "generational differences" as an unfair generalization, and offers a roadmap to intergenerational understanding. While acknowledging that generational stereotypes exist, author Jessica Kriegel argues that they are wrong—and that it's unreasonable to assume that the millions of people born in the same 20-year time span are motivated by the same things, attracted to the same things, and should be dealt with in the same way. Kriegel's experience as Organizational Developer at Oracle puts her squarely in the talent strategy realm, where she works to optimize leadership development, team effectiveness, and organizational design. Drawing upon her experiences with workers of all ages and types, she shows how behaviors know no generational boundaries and how to work with people based on their talents, strengths, and weaknesses rather than simply slapping on a generational label and fitting them into an arbitrary slot. There are 80 million Millenials in America, yet there are myriad books on "managing Millenials" and "working with Millenials" and "the problem with Millenials." This book shows that whether you're working with Millenials, Generation X, or Baby Boomers, age is not the issue—it's the interpersonal dynamics that matter most. Examine the concept of "generational issues"
The human mind craves categorization, so the tendency to lump people together is natural. It may, however, be holding your organization back. The members of each generation have only one thing in common—their age—and even that varies by two whole decades. Why assume that they should all be managed the same way? Unfairly Labeled shows you a better way, and provides a roadmap to a more effective organizational strategy. JESSICA KRIEGEL is an organization and talent development consultant at Oracle. Her expertise is in strategic planning, talent management, leadership development, and intergenerational understanding. She consults on the topic of intergenerational understanding and talent management. She lives in Sacramento, CA.